The Fuzzy Puppy Pet Products Slow Feed Dish is an innovative way to slow down your pets eating. 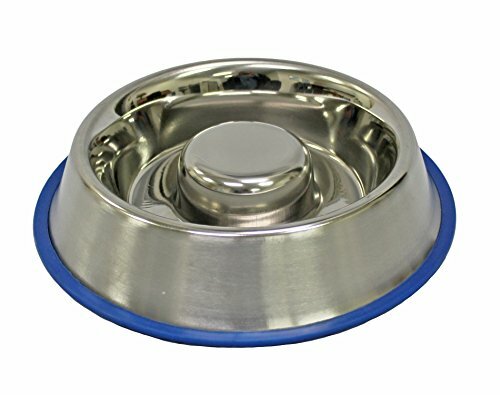 The raised center forces your pet to eat around the outside of the bowl making them slow their eating. Slower eating is better for their digestion and reduces the risk of choking. The wide base and non-slip rubber on the bottom helps keep the bowl secure while your pet eats. The stainless steel design resists bacteria, rust, scratches, breakage and is also dishwasher safe. The stylish stainless steel design makes this dish a must have. View More In Slow Feeders. If you have any questions about this product by Fuzzy Puppy Pet Products, contact us by completing and submitting the form below. If you are looking for a specif part number, please include it with your message.